Special shout out to my husband who let me dress him like a mime for this shoot. Cream Puff or Choux à la Crème is a french pastry. 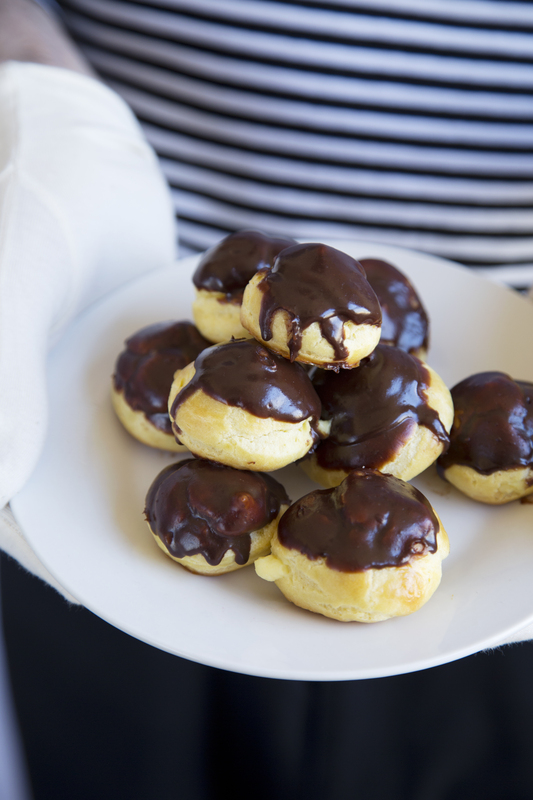 They are sometime called profiteroles or chouquettes, but in all cases they are delicious and if you see some you should drop what you are doing and eat them immediately. If you believe wikipedia (and I usually do, with only a small amount of skepticism) the original reason for calling a pastry profiteroles has been lost in the centuries since its origin, but it later came to mean a roll baked under ashes. Which I guess makes sense. The dough used to make a cream puff is called pâte à choux and used in tons of decadent french pastries, such as éclairs, beignets, and crullers. Another interesting thing is that in french the word choux is plural for cabbage. I am guessing this is because the little buns look a bit like cabbages, but I don’t know for sure. I’d eaten cream puffs before, but the best ones I ever had were at my wedding. My husband is french, so when we got married I begrudging agreed to have the wedding in France (just kidding, I was over the moon to get married in France). Look at all that yummy chocolate. My in-laws were a bit concerned about my expectations for the wedding cake, because they said the traditional french wedding cake was quite different from what we had in the states. They explained to me that a traditional french wedding cakes is called a croquembouche and is a tower of cream puffs, garnished with candied almonds and sugar flowers, wrapped with a spun sugar. Um, yes please. It was as AMAZING as it sounds. Please see the photos below as evidence. 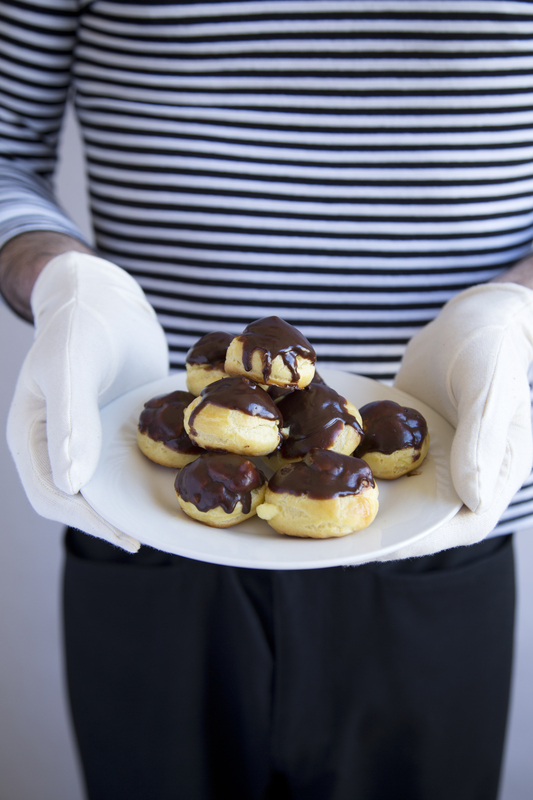 Disclaimer: I wanted to have a stereotypical image of France in the photo with my french pastries, hence dressing my husband as a mime, but on the occasions that I have been to France there is a shocking lack of mimes roaming the streets. In the states we believe there are mimes EVERYWHERE but I’ve only seen two there, and they were not so much mimes and a people dressed in gold or silver standing really still. My husband insisted that these were mimes, but I was adamant that no, mimes wear striped shirts, a beret, and try to escape invisible boxes, anything different is not a mime. Below is a recipe so you can make your own cream puffs. Bon appétit! To make the filling, in a medium saucepan, combine the milk, sugar, butter, and vanilla bean (scraping seeds and adding to the pot), if using. In a medium bowl, whisk egg yolks and cornstarch. Bring milk mixture to a boil over medium-high heat. Gradually whisk hot milk mixture in a small stream into the egg yolk mixture. Slowly whisk egg mixture back into the pan. Cook, whisking constantly, over medium-high heat 1 minute or until thickened. Remove from heat; discard vanilla bean if using or whisk in vanilla extract if not using vanilla bean. Pour into a bowl; place plastic wrap over top. Chill 2 hours or until cold. Heat oven to 350◦F. In a medium saucepan, bring milk, water, butter, sugar, and salt to a boil over medium-high heat. Whisk in flour; cook, stirring constantly, 1 minute. Transfer mixture to a heavy duty stand mixing bowl fitted with a paddle attachment. 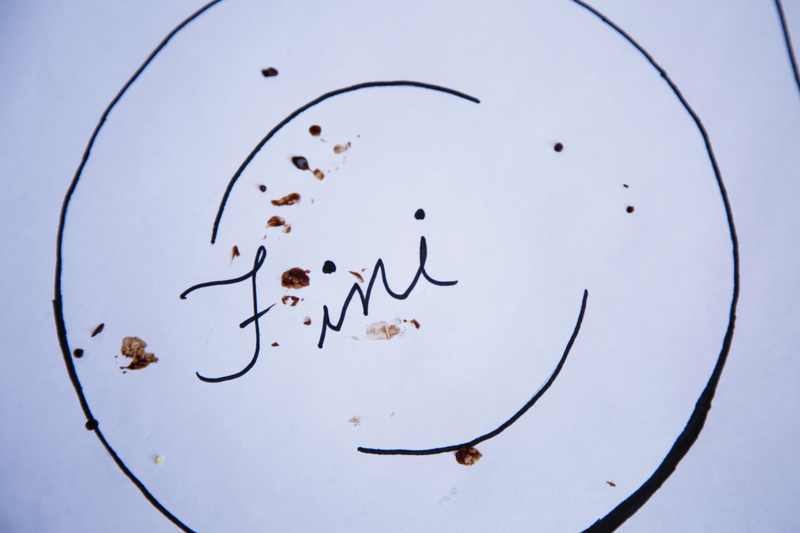 On low speed, add egg a little at a time, beating until all egg is completely absorbed before adding more. Dough should be smooth and glossy and slowly fall off the mixing blade and form a point (like a bird’s beak) when it is ready. All of the beaten egg may not be needed. Spoon mixture into a pastry bag fitted with a round piping tip (about ½ inch wide). Pipe 2-inch balls. Allow 2 inches of space between the dough, as it will expand when baking. Brush with beaten egg. Bake for 20 minutes or until golden brown and dry. Cool completely. Place filling in a pastry bag fitted with a medium-sized round tip. Insert tip into bottom of each éclair and gently squeeze piping bag to fill cavity (do not stuff full). Heat whipping cream on stove top or microwave on high 30-60 seconds until boiling; pour over chopped chocolate. Stir until smooth. 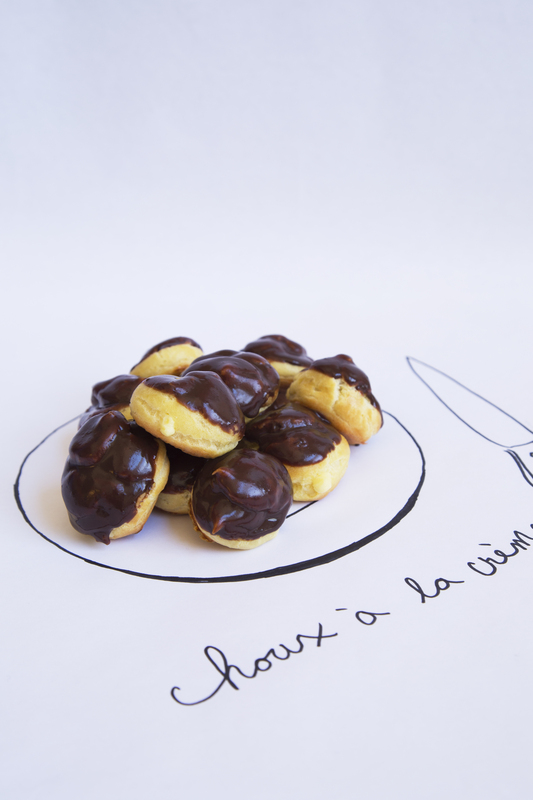 Dip tops of éclairs into chocolate, letting excess drip off. Serve immediately or refrigerate until ready to serve. 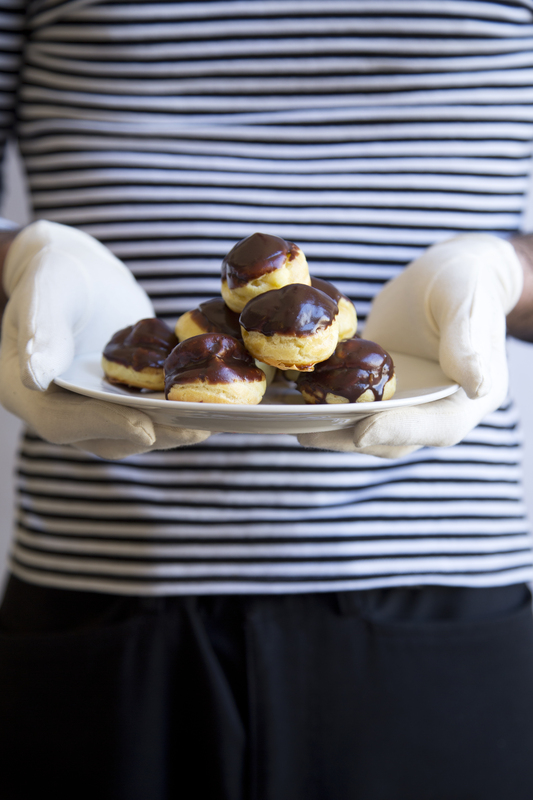 Categories: Recipe | Tags: Choux à la Crème, cream puffs, dessert, food blog, French Dessert, how to cook, Mime, Pate Choux, pâte à choux, Profiterole, profiteroles, recipe, recipes, thejealouscrumpet, Violet Henri | Permalink. 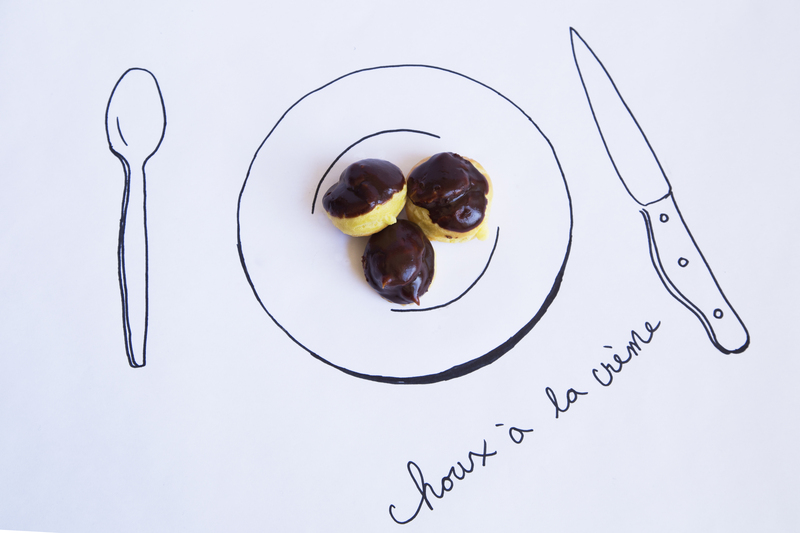 Superb, you look like ” Le mime Marceau” 🙂 and the choux a la creme look delicious. Thank-you! Seriously everyone should have creme puffs all the time. The french do know how to make amazing food! Perfect profiteroles! Thanks for reminding me how much I love them and how I need to make them from scratch soon. Thank-you so much! Yes, I need to remake them too. They are perfect!